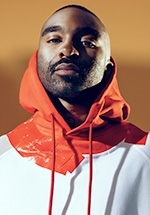 Riky Rick is a South African rapper, actor, writer and producer who rose to fame with singles like Nafukwa, Amantombazane and Boss Zonke. He has made appearances on numerous television series including Screentime with Nicky Greenwall, Rolling With..., Coke Studio, The Hustle, Zaziwa, Isibaya and Rhythm City. In 2019 he was one of the judges of the M-Net reality competition series The Voice, joining in a cast shakeup in Season 3.